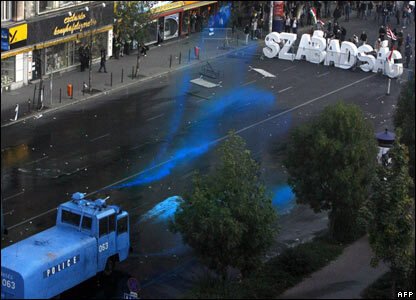 Clashes have broken out in central Budapest between police and protesters as Hungary marks 50 years since the country's failed anti-Soviet uprising. 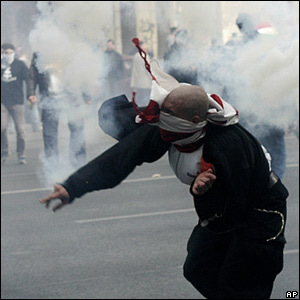 There are reports of tear gas, rubber bullets and water cannon being used to disperse protesters, who are angry at the prime minister's recent admission that he lied to voters. 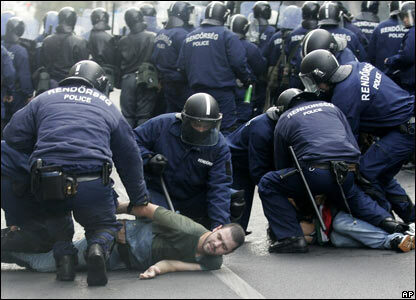 Protesters are demanding Prime Minister Ferenc Gyurcsany's resignation. The letters held against the barricade spell the word "freedom". 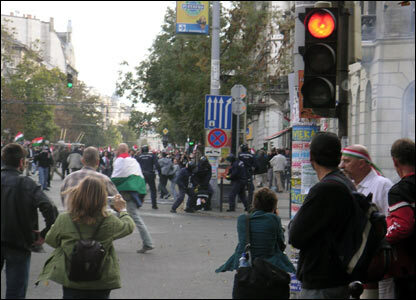 Several protesters were reported to have been injured during the city-centre clashes, which BBC News Website reader Greig Callan captured in this image. 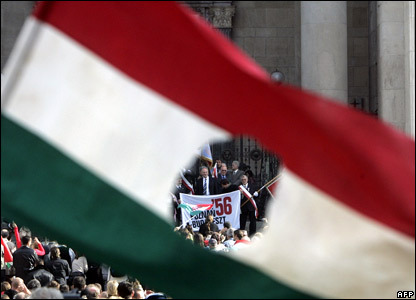 The protests have overshadowed official events to mark the 1956 uprising. 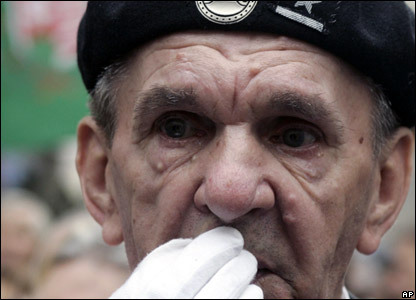 Thousands were killed as the attempted revolution was quashed. 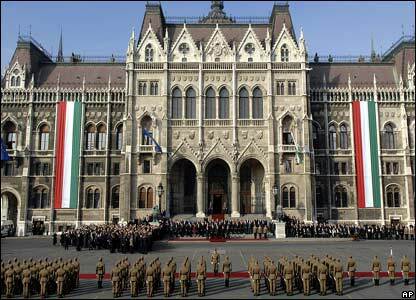 Riot police cleared the square in front of Budapest's parliamentary building where protesters had gathered. Earlier in the square, events began to mark the demonstrations that led to the country's attempted revolution, in the same square, 50 years ago. 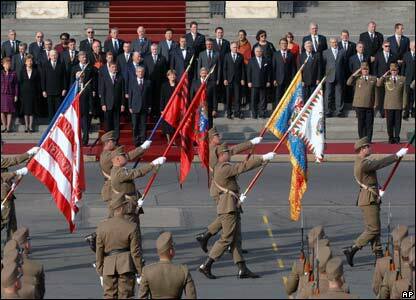 Dignitaries and foreign heads of state watched as the country's historic flags were paraded. 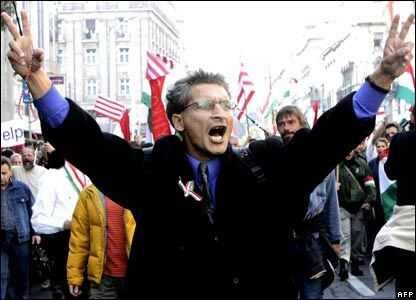 But elsewhere in Budapest, protests continued, sparked by Mr Gyurcsany's admission that he had lied about the state of the economy. Many are demanding that Mr Gyurcsany leave office. 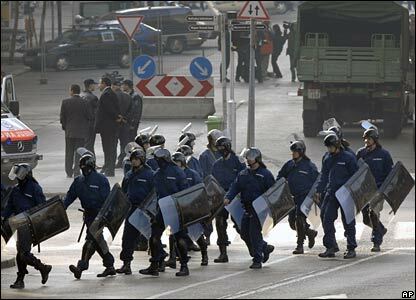 The capital saw three days of rioting in September. 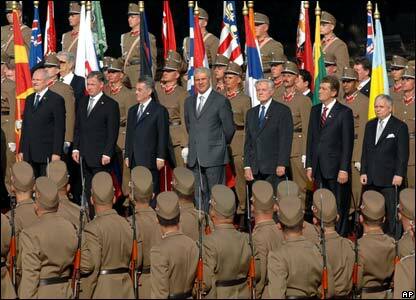 And although foreign heads of state are in attendance, the country's opposition party says it will boycott events where the prime minister is speaking.